The back of your upper jaw, or maxilla, contains less bone than the corresponding area in your lower jaw, or mandible. That’s a simple fact of human anatomy. As a result, however, you may need sinus lift surgery to replace missing upper molars with dental implants. A sinus lift, also called sinus augmentation, adds bone to the upper jaw near the area of the molars. Along with the fact that the upper jaw provides less bony support under normal circumstances, a variety of conditions can reduce the amount of bone in this area. Periodontal disease leads to bone loss. After the extraction of molars, dental bone absorbs into the body, reducing bone mass. Vacant tooth sockets can collapse, creating an empty ridge. Birth defects can limit the amount of bone in the upper jaw. Injury to the jaw can eliminate bone tissue. In addition to these problems with the jaw itself, the maxillary sinus cavities on either side of the nose can intrude on the upper jaw and grow larger over time, limiting the amount of bone and the area that can provide a place for dental implants. First performed in the 1970s, the sinus lift procedure adds grafted bone to the upper jaw so it can support dental implants. The same procedure moves the maxillary sinus out of the way to provide room for the bone graft. The graft can come from the patient’s own body, often from the hip or the lower leg bone known as the tibia. This is called an autogenous graft, meaning that it consists of self-generated bone. Some grafts use donated human or bovine bone processed into a purified, granulated substance that can be packed in place. Grafting materials also include manufactured synthetic products. A traditional sinus augmentation begins with an incision into the gum tissue at the back of the upper jaw in the region of the premolars or molars. After this incision, the soft tissue can be pulled out of the way, making the jawbone visible. The size and position of the incision determine how far the flap of tissue can move and how much of the bone it can reveal. Cutting an elliptical window in the jawbone reveals the sinus membrane, the separation between sinus and jaw. Elevating the membrane away from the jaw raises the floor of the sinus and creates space for several millimeters of grafting material. With the sinus lifted up and the graft packed into the area, the gum tissue receives several sutures to hold the surgical area closed so it can heal. After sinus lift surgery, the patient can experience swelling, possibly accompanied by bleeding from the nose or mouth. It’s important to dab at the nose rather than blow it and to avoid hard sneezes, either of which could disturb the sutures and the graft. Likewise, the patient should keep fingers and tongue away from the graft to avoid disturbing it. 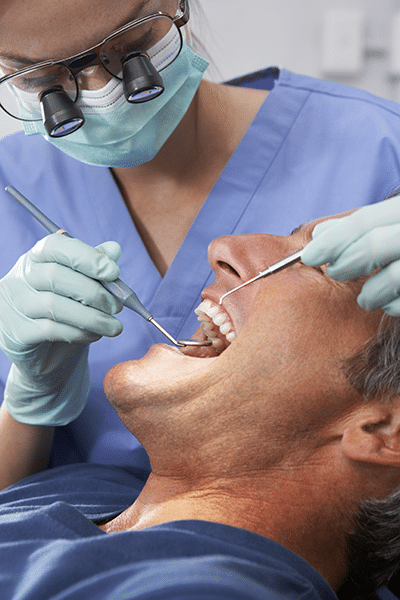 To allow the area to clot properly, the patient may be asked to avoid rinsing, spitting, brushing, flossing, and wearing removable dental work immediately after surgery. Tobacco use interferes with healing, as do activities that rely on blowing a concentrated stream of air or that increase sinus pressure, including scuba diving, flying in pressurized aircraft, playing a wind instrument, lifting weights, or inflating balloons. Over the next four to 12 months, the body creates new bone in and around the area of the graft. After the body finishes integrating the graft into new bony tissue, a periodontist can place the posts that support dental implants.